TERRIFIC Thomas Jorgensen romped to a full house in King’s Lynn’s brilliant 52-38 win over Ipswich. The result was sweet revenge for their defeat in Suffolk and keeps them in contention in the Premiership Cup group stages. Jorgensen had been inconsistent in the early stages of the season but he was in an unstoppable mood against the Poultec Stars’ rivals. “Well, that went pretty well!” was his post match reaction. “I’m really pleased about that, but it’s not about me, it’s about the team and this is a great result for us. Stars opened up with a 5-1 in the rerun of Heat One - skipper Robert Lambert received a warning for moving at the start. Visiting star Chris Harris fell heavily resulting in the race being awarded. 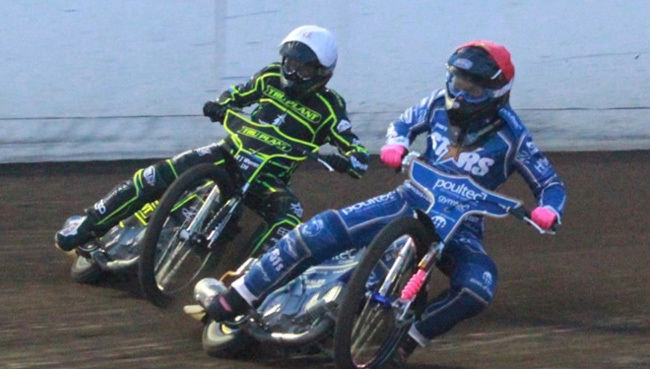 Ipswich then secured back-to-back heat advantages which suggested a close contest was ahead. Stars took the lead in Heat 5 after back-to-back 4-2 advantages. Ipswich bounced back but Michael Palm Toft came in as a reserve switch in Heat 8 and it worked superbly as he partnered Erik Riss to a 5-1. KING’S LYNN 52: Thomas Jorgensen 14+1, Michael Palm Toft 11, Robert Lambert 10+1, Erik Riss 7+2, Lewis Kerr 6, Ty Proctor 4, Kasper Andersen 0.